I’ve had the privilege and honor to be part of several opening bell ceremonies at the NYSE Euronext. Often I’ve been asked to share what it’s like to be part of this ceremony and ultimately ring the ceremonial bell that commences trading. Here is a brief description of the experience. The NYSE Euronext is a tremendous host and treats guests with a display of history, tradition and hospitality. It begins with a walk down the halls of the NYSE Euronext towards the elevators. These halls, and the halls several levels up, are lined with iconic images of many of the world’s most recognizable personalities and leaders visiting the NYSE. From Ronald Regan to Mikhail Gorbachev one can’t help but to feel humbled by images of the people who have helped make the tradition and brand of the NYSE Euronext known worldwide. Once through the halls, guests are escorted to a room of enough size to accomodate invited guests. These rooms have held anywhere from a dozen to over 40 guests. Guests are generally served breakfast which ends with an informal ceremony led by the senior NYSE official in attendance. In my experience, the most senior official from the NYSE will say a few words about the listing company or product and then present officials from that company a framed listing certificate. After a few pictures are taken, the group of guests is separated into two different groups — the ones privileged to be on the podium for the bell ringing and the other group who will watch the bell ringing from the floor below the podium. The participants in each group are usually selected ahead of time by the listing company and the number is constrained by the fact that the podium really does not hold many people, perhaps no more than eight comfortably. Being a part of the opening bell ceremony at the NYSE Euronext is a great privilege and one that is truly historic in nature. I have been told that over a billion people around the world witness the images of the opening bell each day. The exchange delivers a world class experience that speaks to the premier status it has attained. I am honored to have experienced this unique ceremony and hope this description has conveyed an interesting look behind the scenes of the opening bell. 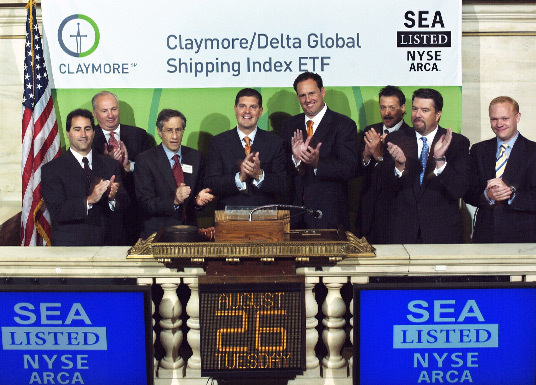 Christian Magoon rings the opening bell at the NYSE Euronext in 2008.